The eagerly anticipated sequel to Gayle Brandeis' beloved Bellwether Prize-winning novel The Book of Dead Birds is now available exclusively as an ebook. Narrated by Darryl Sternberg, Ava Sing Lo's love interest from The Book of Dead Birds and now her husband and the father of their baby, The Book of Live Wires is an electrifying novel about love, identity and family secrets. Still grieving the death of his first wife, Darryl Sternberg enlists a woman to translate his grandmother's journals from Russian, French and Yiddish. He finds himself increasingly embroiled with his quirky yet provocative translator as she uncovers hidden stories within his Jewish roots. His new wife Ava, meanwhile, is searching for her unknown father, who had been a black soldier in Korea. Their baby is diagnosed with sickle cell anemia; as Darryl and Ava learn to navigate Bella's illness, they also learn to navigate and confront the secrets they've kept from one another (and themselves). Readers of The Book of Dead Birds will cheer the return of cherished characters, and new readers will fall in love with the Sternberg-Sing Lo family for the first time. Filled with humor and heartache, The Book of Live Wires is ultimately a story about moving forward with love, even in the face of uncertainty. Gayle Brandeis is the author of Fruitflesh: Seeds of Inspiration for Women Who Write (HarperOne), the novelsThe Book of Dead Birds (HarperCollins), which won Barbara Kingsolver's Bellwether Prize for Fiction of Social Engagement, Self Storage (Ballantine), and Delta Girls (Ballantine), and her first novel for young people, My Life with the Lincolns (Henry Holt), which won a Silver Nautilus Book Award. 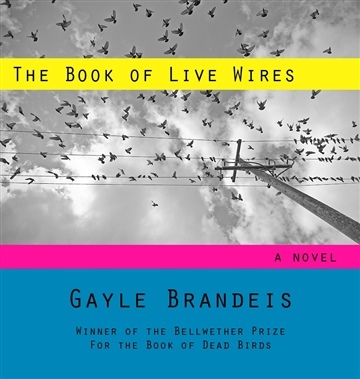 She published The Book of Live Wires, the sequel to The Book of Dead Birds, as an ebook in 2011. Her poetry, fiction and essays have appeared in such places as Salon.com and The Rumpus, and have been widely anthologized. In 1986, when she was 18, Gayle's essay on the meaning of liberty was one of three included in the Centennial time capsule of the Statue of Liberty. Gayle teaches in the MFA Program in Creative Writing at Antioch University and lives in Riverside, CA, where she is mom to two adult kids and a toddler. She is serving a two year appointment as the current Inlandia Literary Laureate.